▼ 3 Collaboration Employees return! During this period, the Collaboration Employees [Illya], [Miyu], and [Kuro] from [Prisma☆Illya 3drei!!] will return! ※ The above 3 employees will only appear during the [Fate/kaleid liner Prisma☆Illya 3drei!!] returning collaboration event and will have increased resume rates. Furthermore, using the [Limited] Prisma☆Postbox will increase these chances. ※ Collaboration Employees cannot use Mirrors of Transformation to change their Collaboration. ※ The above 3 employees can be recruited from the rewards received from the [Collaboration Commemoration Shinestone Purchasing Campaign]. ※ After the limited period, the above Collaboration Employees' resumes will no longer appear. ※ Collaboration Employees are not affected by Public Relations Department's class recruitment bonus. ▼ Log in and receive [Kuro] as a present! During this period, all users who log in and visit the special event page will receive a [Limited] Kuro's Envelope! Using the [Limited] Kuro's Envelope will guarantee a resume from the Collaboration Employee [Kuro]! A quest that does not consume any Bread. Read the story of how Illya and her friends arrive in Misterio. 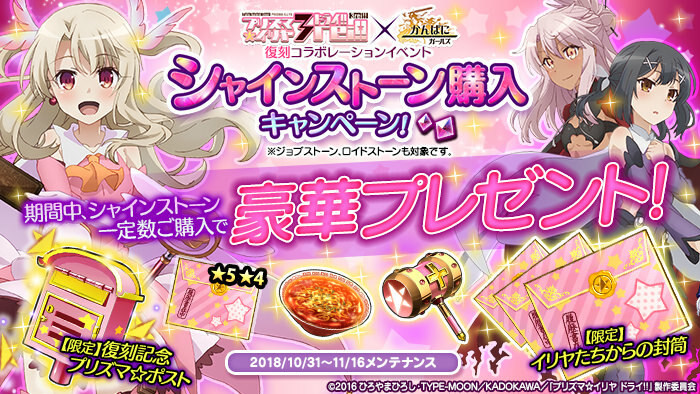 An event quest that rewards [Limited] Prisma☆Illya Medals and EXP. There is a chance of getting [Limited] Prisma☆Posts and [Limited] Hero's Sanctuary Invitation Tickets as rare drops. Use the [Urgent] [Unexplored] Invitation Ticket to unlock this urgent quest for 30 minutes. There is a chance of getting [Limited] ★5・4 Prisma☆Envelopes and [Limited] Fairy's Sweet Sake as rare drops. Also, there is a chance of [Prism Bottle Slimes] appearing which give large amounts of EXP. Use the [Limited] Hero's Sanctuary Invitation Ticket to unlock this quest for 15 minutes. This quest drops lots of [Limited] Prisma☆Illya Medals. There is a chance of getting [Returning] Illykuma as rare drops. ▼ Exchange for items at the Event Exchange Shop! Visit the Event Exchange Shop from the special event page. 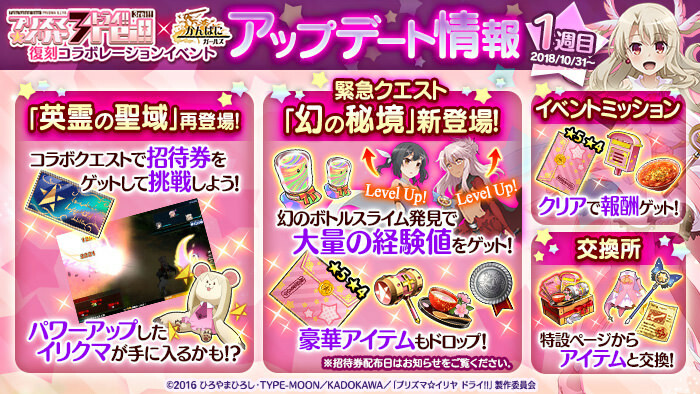 [Limited] Prisma☆Illya Medals that you can obtain from the collaboration quests can be exchanged for items here. ▼ [Limited] Hero's Sanctuary Invitation Ticket reappears! The collaboration quest can have a rare intruder that may drop the item [Limited] Hero's Sanctuary Invitation Ticket which unlocks this special quest for a certain amount of time. The [Limited] Hero's Sanctuary Ticket unlocks the [Hero's Sanctuary] for 15 minutes, where you can obtain large amounts of [Limited] Prisma☆Medals, and if a rare intruder appears, you can get the powered up collaboration limited accessory [Returning] Illykuma. ▼ Urgent Quest [Phantom Unexplored Region] appears! During this period, you can receive [Urgent] [Unexplored] Invitation Ticket in your in-game mail at certain times. Using the [Urgent] [Unexplored] Invitation Ticket will unlock the urgent quest [Phantom Unexplored Region] for 30 minutes, where you have the chance to earn [Limited] ★5･4 Prisma☆Envelope, [Limited] Prisma☆Hammer+, and [Limited] Fairy's Sweet Sake as rare drops and other wonderful items. There is also a chance of [Prism Bottle Slimes] appearing, which give a large amount of EXP. The Urgent Quest schedule can be found in the game announcements panel and below. ※ The [Limited] [Unexplored] Invitation Ticket that can be purchased from certain Shop sets can be used at any time during the event. ※ The official twitter account will announce one hour before hand when the urgent quests will begin. 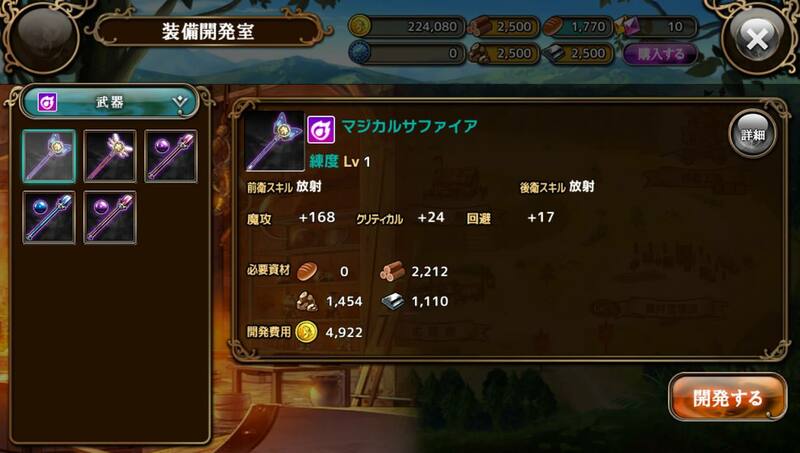 ▼ Collaboration Employee's Exclusive Equipment Recipes appear! The Event Shop features recipes. Purchasing these recipes will allow you to manufacture the collaboration employee's exclusive weapon and armour. Manufacturing the exclusive weapon's +3 will allow your employees to use powerful skills. Event Limited missions appear. Completing these missions will give various rewards. See the Event Tab in the [Mission] menu to confirm. ▼ Event Limited Accessory [Returning] Illykuma appears! You can obtain this accessory from the Event Exchange Shop and collaboration event quest [Hero's Sanctuary]. It can be equipped by all employees. Change your employee's costumes to that of [Illya], [Miyu], or [Kuro] with this item. 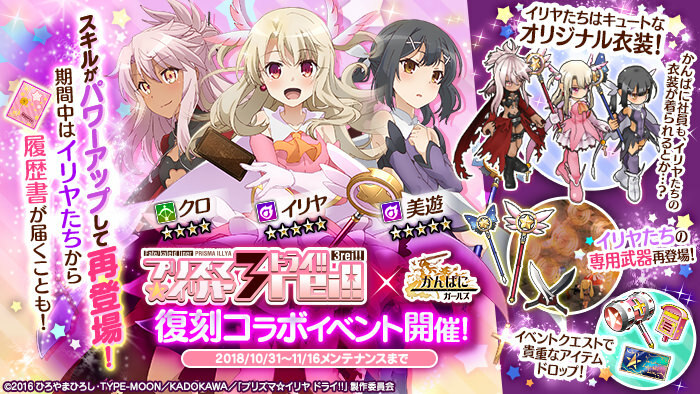 [Illya's Costume] and [Miyu's Costume] are Magician exclusive and [Kuro's Costume] is Archer exclusive. ※ Equipping this item will change an employee's appearance in battle/formation. ※ This item does not affect an employee's abilities. ※ Mirrors of Transformation cannot be used to create [Illya's Costume], [Miyu's Costume], or [Kuro's Costume]. ※ [Limited] items will expire with the event. ※ Certain item effects only affect [Collaboration Quests] which include the following. Note: This envelope contains 3 black envelopes and 1 collaboration envelope. The collaboration envelope is approximately 95% Kuro. The other two are affected by the current rate up. Note: Exists but not mentioned in the event notes. Not obtainable yet? Increases the chance of resumes appearing from Collaboration Employees for 15 minutes when used. Increases the chance of resumes appearing from Talented Employees for 5 minutes when used. ※ The first draw after using this postbox is guaranteed to be ★4 or higher. All draws after are guaranteed to be ★3 or higher. Increases the chance of Pluses appearing when manufacturing Illya Collaboration Employee Exclusive Equipment for 15 minutes when used. 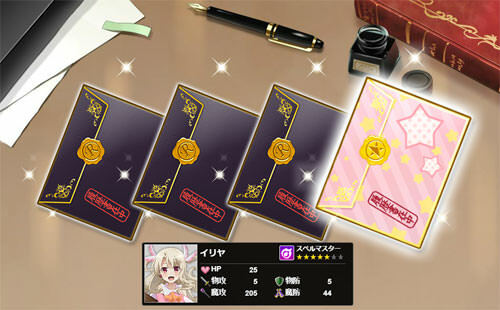 Greatly increases the chance of Pluses appearing when manufacturing Illya Collaboration Employee Exclusive Equipment for 15 minutes when used. Large amount of EXP if you find the phantom bottle slimes! An invitation ticket to the [Phantom Unexplored Region] quest where you can obtain valuable items. Unlocks the [Phantom Unexplored Region] Quest for 30 minutes when used. Expires 24 hours after the distribution time. Please check the distribution times for more details. Unlocks the [Phantom Unexplored Region] Quest for 30 minutes when used. A beckoning cat that brings good fortune when set up. An indispensable good for companies looking to earn money. Milk that grants even more fame. Even higher grade than the type Monique is always drinking. An envelope from whereabouts unknown, containing resumes from Talented Employees. Using voice stones for the collaboration employees will unlock new voice lines. Voice Stone Illya (3): [Illya] and [Miyu or Kuro] are in the same party and battle begins. Voice Stone Miyu (3): [Miyu] and [Illya] are in the same party and battle begins. Voice Stone Kuro (3): [Kuro] and [Illya or Miyu] are in the same party and battle begins. Log in every day and check your in-game mail for log-in bonuses! Make sure to check before they expire the next day! ※ The event will end with the 11/16 (Fri) maintenance. ※ [Limited] items with no icon on the upper left will expire with the 11/16 (Fri) maintenance. [Prisma☆Illya Drei!!] returning collaboration event confirmed! We will be bringing back this collaboration event! You will have a chance to recruit the three characters from Prisma☆Illya as employees! Duration: 10/31 (Wed) maintenance to 11/16 (Fri) maintenance. Includes previews of the exclusive skills. They will also feature increased power from last time. [Advance Announcement Retweet Campaign] begins! 100 winners of the lottery will receive the ★5 Employee [Illya] as a present! To participate, follow the official twitter account and retweet this tweet. 4 out of 0 members found this post helpful. Last edited by Folseus; 11-05-2018 at 12:36 AM. "I get it Kyousaru, you smoke weed everytime you do your art." @Krad Hunter From the Kanpani patch note. The 5* 4* prisma envelope also final reward for completing all the event missions. 1 out of 0 members found this post helpful. Last edited by Mikan; 10-31-2018 at 11:43 AM. Unfortunately, I do not have time to continue updating this thread for another few hours. Most of the content is the same as the original event, so check that thread as a reference. 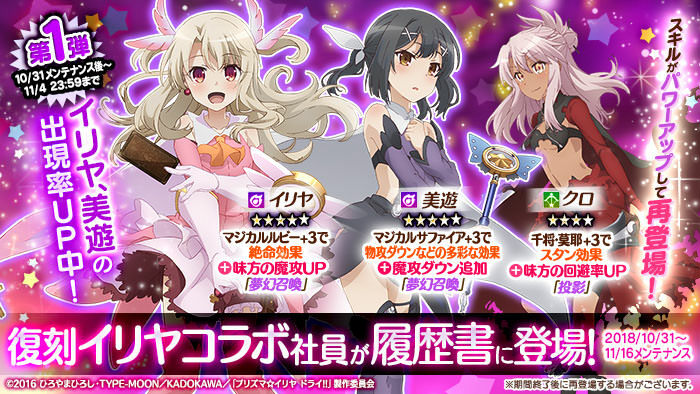 The new things are the Urgent Quests, ★5・4 Illya Envelopes, and Illya, Miyu, and Kuro have skill updates. 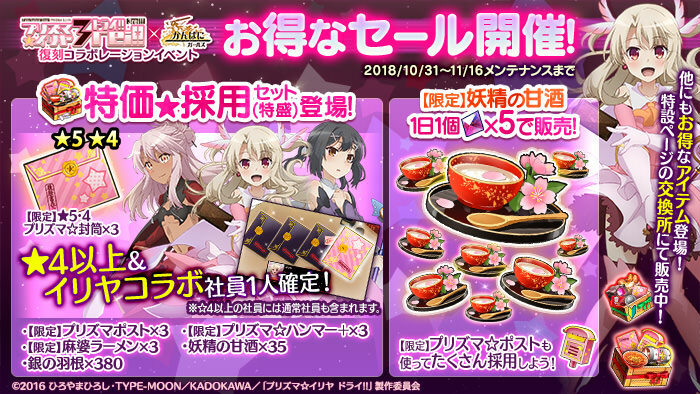 Also, the first page of the event shop, except for the Kuro Envelope, is Daily Sales, and will change or restock every day so get them quick. [Returning] Illykuma accessory got some sort of a buff. I haven't checked it yet, but I think it's supposed to be strong. The damage didn't change, only got the EVA buff. Big change to damage and effect. 3 Targets is almost always better than 2x2 since there's almost never 4 enemies in a 2x2 to hit. Last edited by Folseus; 10-31-2018 at 12:42 PM. Last edited by Mikan; 11-01-2018 at 11:26 AM. @Fiir-chan Yeah the ticket looks like this. The blue ticket, according to the JP Wiki has character drop Miyu and Kuro. Not sure if that true or not? If someone can confirm it? Last edited by Mikan; 11-01-2018 at 02:38 PM. So, after seeing that I can get Miyu with the ★5★4 Prisma☆Envelope I installed this game and successfully get her after an indefinite number of rerolls because she's too precious to me and I can't miss the chance to have a game where I can ear her voice when I open it. I'm not planning to play seriously, but I want to max her and so I am here to ask a couple of things, if you don't mind. Is there anything that I must obtain before the end of the event that otherwise will lock me out of the possibility to max her?